Cowboy comic, movie star, and political commentator Will Rogers was a genuine superstar in his day — think a combination of Jon Stewart and Tom Hanks — but it’s his quotations that really sing to us right now. There’s something about the basic sanity of these little packages of genius that is a little bit extra poignant in a political moment where nothing seems to be on the table other than economic and political suicide. “I am not a member of any organized political party. I am a Democrat.” I borrow that one a lot, but it seems like the rival party could pick that one up very soon. “There are three kinds of men. The one that learns by reading. The few who learn by observation. The rest of them have to pee on the electric fence for themselves.” Remind you of anyone? And so, for this truly, madly, deeply meshugganeh moment in American politics, I bring you a quite decent cocktail right out of the pages of the Prohibition-era classic, The Savoy Cocktail Book, named after a man who was a little bit better than decent. He was sane. The drink isn’t bad, either. Combine the ingredients in a cocktail shaker with plenty of ice. Shake vigorously and strain into a cocktail glass. Toast comedians, for they are the only reliable source of political wisdom on our small planet. Wikipedia tells us that this Plymouth Gin is featured in exactly 23 cocktail recipes in The Savoy Cocktail Book where, in fact, I first found today’s recipe. Leaving my decades long membership in the cult of the number 23 aside (thank you Robert Anton Wilson and William S. Burroughs) I admit to having been a bit confused by whether Plymouth was a style of gin or a brand of the gin. Turns out the answer is, “yes.” Ever so slightly less dry and more fruity than the London dry gin most of us know, it’s made in Plymouth, a town about 190 miles from London from whence came our turkey-and-cranberry eating Puritan forebears. While there was once more than one brand of the Plymouth style of gin, today there is only Plymouth Gin; the brand and the style are now synonymous. At 82.5 proof, it’s relatively gentle compared to most premium gins, which are often closer to 90 proof or above, but stronger versions are manufactured. It’ll cost you more than even some very good brands of gin; I shelled out 28 smackers at an outstanding discount emporium out here in glamorous Van Nuys. 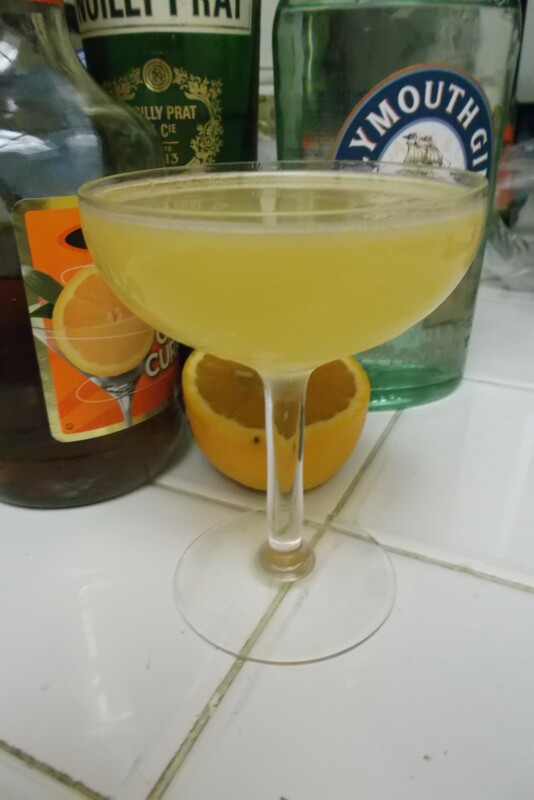 I made the Will Rogers using a good London style gin as well as the pricier Plymouth variety, and I have to say that extra expenditure might be worth it for cocktail perfectionists. Using very good, but more reasonably priced Bombay Dry, it was fine, but the Plymouth version had just that extra bit of, er, zazz to it. It’s a technical term for, er, tangy complexity, or something. On the other hand, whatever you do, stay away from the alternate version of the Will Rogers which I found floating around a number of cocktail sites. That one contains 1.5 ounces of gin, half an ounce of dry vermouth, a mere tablespoon of orange juice, and a dash (let’s say half a teaspoon) of triple sec instead of curacao. Yes, I have met a cocktail I didn’t like.